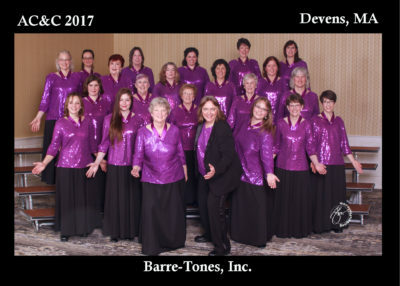 The Barre-Tones is a performing and competing chorus that has been entertaining audiences in central Vermont since 1969. We love to sing and rehearse weekly, striving always for musical excellence in the company of women who share our passion for music. We celebrate friendship and personal growth through music, leadership, education and democratic principals. Our chorus offers a warm welcome to the world of a cappella four-part harmony and an excellent learning program in vocal and visual performance. We are a vibrant group of amazing women of all ages recognized for excellence in singing close four-part harmonies in the barbershop style. Our members come from central and northern and northeastern Vermont and we are active in our communities and perform at public and private events, large and small. As proud members of the international singing organization, Harmony Inc., we travel twice a year to compete at regional and international contests. The Barre-Tones women’s chorus rehearses each Monday evening at 7:00pm at Capital City Grange (Rt 12, just 1 mile up from the Rt 2 light in Montpelier). We welcome guests any Monday! Check the events calendar for the chorus performance schedule. ….join in on the fun! Email us, or call us at 802-552-3489 with questions!